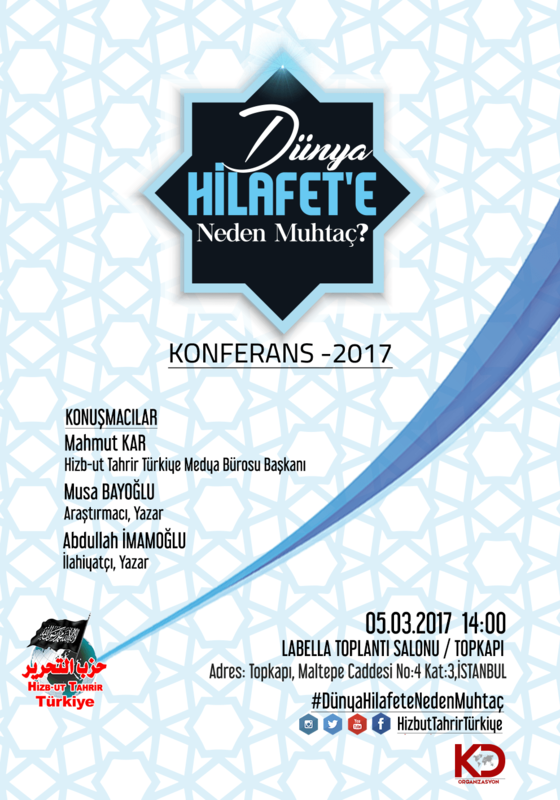 Hizb ut-Tahrir (the Party of Liberation), an outlawed religious organization that was banned in Turkey because of violence, plans the hold a caliphate conference in İstanbul on March 5th, a year after it held similar conference in Turkish capital Ankara. The meeting, titled as “Why the world needs Caliphate’, will take place on Sunday at İstanbul’s Topkapı district where headquarters of Ottoman State located. Hizb ut-Tahrir in Turkey is led by Mahmut Kar. Here is what journalist Abdullah Bozkurt wrote about Hizb ut-Tahrir on April.24, 2015 in his blog: “Hizb ut-Tahrir has been in business in Turkey since the late 1960s as a small and not very effective Islamist group. It was closely monitored for years. It reasserted itself in September of 2005 when it held a demonstration at İstanbul’s Fatih Mosque, with its members calling for re-instituting the caliphate and chanting slogans against Turkey’s founder, Mustafa Kemal Atatürk. In 2009, Turkish police detained nearly 200 suspected members of Hizb ut-Tahrir in simultaneous raids in 23 provinces across Turkey on charges of being members of an outlawed organization and planning bloody attacks against civilians. Police said the group was planning to stage a large attack in İstanbul on the anniversary of the abolisment of the caliphate. The Ottoman Caliphate was abolished by Atatürk on March 3, 1924, following the founding of a secular state. In June 2011, prosecutors ordered police again to launch an operation against Hizb ut-Tahrir cells in five cities, detaining 17 people, including Serdar Yılmaz, the alleged member responsible for Turkey operations. Turkish investigators discovered that the group was regularly funded by Imameddin A.A. Barakat, a Jordanian citizen of Palestinian origin who resides in Israel. Bookkeeping records of Hizb ut-Tahrir members that were seized during the operation revealed that a businessman acting as a courier named Mazin Harbawi entered Turkey with bags of money every two months and gave the money to V. A., the member in charge of Hizb ut-Tahrir’s İstanbul operations. Investigators believe Harbawi smuggled in about $40,000 during each visit. While law enforcement agencies have been battling with Hizb ut-Tahrir cells and concerned that the network may be a conveyer belt for the militant recruitment for more radical and violent groups in Turkey, political Islamists in the government rushed to rescue them. In July 2012, a government-endorsed bill was hastily adopted in Parliament that paved the way for the release of over 100 members of Hizb ut-Tahrir from prison, including senior leaders. Conveniently, the decision was issued after working hours on Friday, preventing prosecutors from challenging the release. By the time the objection was finally filed with the court on Monday, most of the released had gone into hiding. When the government finally took over control of the Supreme Board of Judges and Prosecutors (HSYK), the judicial council that assigns, promotes and investigates judges and prosecutors in Turkey, in 2014, political Islamists became much more emboldened in their interference in the criminal justice system. On the one hand, they abused judicial probes to punish their critics and opponents with sham investigations and trumped-up charges, and on the other, they deliberately sabotaged legitimate investigations and derailed ongoing trials of extremist, violent and armed Islamist groups including Hizb ut-Tahrir, al-Qaeda and the Islamic State of Iraq and the Levant (ISIL). For example, Turkish prosecutor Hanifi Yavuz, who was recently assigned the 2011-dated Hizb ut-Tahrir case, asked the Gaziantep 1st High Criminal Court on March 26 to acquit all 17 suspects by saying the group is not a terrorist organization but is rather a political Islamist group. Following the prosecutor’s plea, the court acquitted all the suspects, despite the overwhelming evidence in the indictment against them. This was a clear violation of a superior court’s decision that should be binding in the Gaziantep court because the 9th Chamber of the Supreme Court of Appeals issued a verdict on April 24, 2008, classifying Hizb ut-Tahrir as a “terrorist organization that threatens the existence of the republic and the state.” The Ankara 11th High Criminal Court also rendered a judgment on April 19, 2004 describing Hizb ut-Tahrir as a terrorist organization.